Nearly 80 percent of China's energy-related CO2 emissions come from coal. That's why putting a lid on coal is the single most important step China can take to protect itself - and the rest of the world - from the devastating impacts of climate change. One of China's most important think tanks - the National Center for Climate Change Strategy and International Cooperation (NCSC) - released two reports (see the English press release and Chinese executive summary) yesterday detailing how a national cap on coal consumption can help China peak its CO2 emissions earlier than its official 2030 commitment date. 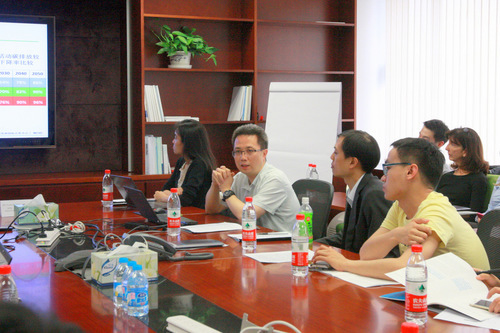 I was honored to attend the launch of these reports at a meeting in Beijing organized by the China Coal Cap Project, a joint initiative of 20 academic, government and non-profit researchers led by NRDC. The Director of the Strategic Planning Department at NCSC, Mr. Liu Qiang, began his presentation by acknowledging that human activities are the main cause of climate change, and that climate change is already causing major damage in China (I discussed the climate warnings from one of China's top meteorologist here). Mr. Liu then described how the first report set forth three carbon emission control pathways for China - strong, high and medium emissions control pathways - with greater to lesser chances of contributing to the global 2 degree Celsius target. Each of the pathways presented an emission range based on a variety of factors, including Intergovernmental Panel on Climate Change (IPCC) Representative Concentration Pathways, historical responsibility, and the use of clean energy and Carbon Capture, Utilization and Storage technology (CCUS). The strong emissions control pathway, which would enable China to peak its carbon emissions before 2020 at current levels and reduce emissions quickly afterwards, would have the strongest chance of achieving the 2 degree Celsius target. But according to NCSC it would present a very challenging low-carbon transition challenge for China's energy and industry, and would be very difficult to achieve. The high emissions control pathway would require China to peak its energy-related carbon emissions between 2020 and 2025 at about 10 billion tons. This pathway would require China to reduce its carbon intensity by 90% by 2050 compared to 2005 levels, equivalent to the level of OECD countries in 2010. The medium emissions control pathway would require China to peak its carbon emissions by 2030, limiting peak emissions to 12 billion tons or less. This pathway is closest to China's already announced carbon reduction goals, and would allow China to achieve a reduction in carbon intensity of 85% by 2050 compared to 2005 levels. However, it has a lower chance of achieving the 2 degree Celsius target, demanding additional international effort to further reduce carbon emissions. The study recommended three strategies for China to control its CO2 emissions by: (1) improving the quality of its energy structure and shifting to cleaner energy; (3) controlling not only carbon intensity, but also absolute carbon emissions; and (3) using carbon controls as a strong constraint on coal consumption. The latter would help to level the playing field among energy sources and ensure that coal does not enjoy an unfair advantage over low-carbon energy sources. 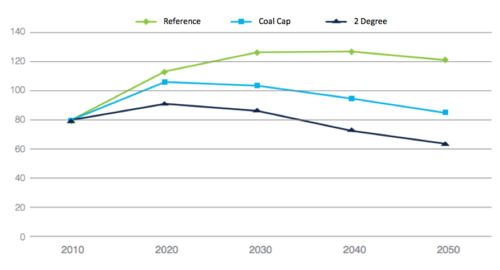 To implement these strategies, the study recommended that China: (1) concentrate coal consumption in sectors where it can be consumed more cleanly (such as the power sector); (2) introduce strong carbon standards in key industries to reduce the use of coal and its carbon emissions, including CO2 emissions standards for new coal power plants; (3) pilot and scale up key technologies such as supercritical and integrated gasification combined cycle (IGCC) power plants, waste heat re-use, and carbon capture, utilization and storage (CCUS); and (4) encourage coal-consuming industries to engage in carbon trading. These measures could have an enormous impact. Setting a carbon emission standard for the power sector, for example, could revolutionize the entire power sector, and provide a strong boost to renewable energy development in China. 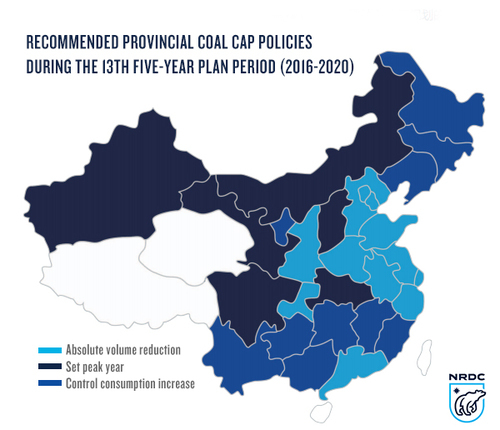 The second NCSC study provided a roadmap for implementing a national coal consumption cap by recommending carbon trajectories for four categories of provinces in order to help the country peak its CO2 emissions by 2030 or earlier. This effort would recognize the widely different levels of economic development in different regions of China, a realistic and achievable approach that China has used in setting a wide range of environmental protection standards and regulations. 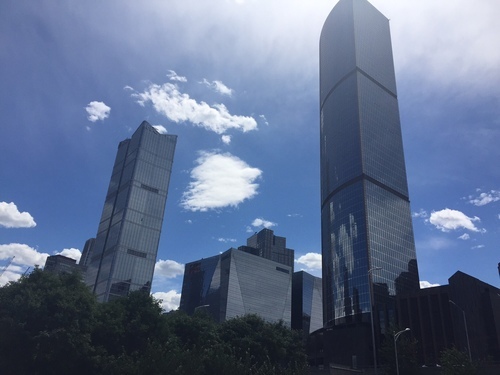 The day after these two reports were issued, I was treated to one of the most brilliant blue skies I've ever experienced in Beijing. It seems that Beijing's persistent efforts to combat air pollution are starting to show results, though a lot more still needs to be done. It gave me hope that China can achieve its coal consumption cap and CO2 reduction goals earlier than we may think, bringing enormous health, environmental and economic benefits to the entire country. This blog was coauthored by NRDC China Climate and Energy Project Director Alvin Lin.